Light changes the atmosphere and distorts how time is passing with each shift I make in the theatre space. It is a powerful aspect of how the public perceives tension and how dancers, performers and musicians are defined visually. In real time theatre, I am able to influence, and therefore, interact with the choices the performance artists are making. This is a specific study for performance artists in how they need to feel and read the light states and changes while in the process of executing their work. In in the workshop, I want to to do short improvisation sessions, allowing for the performance artists to be in the piece or out viewing, using different light states and shifts, so that the performance artists have an opportunity to experience the possibilities light can produce in real time. We will engage with feedback and discussion in the breaks and I will share some of the technical reality’s of my work. 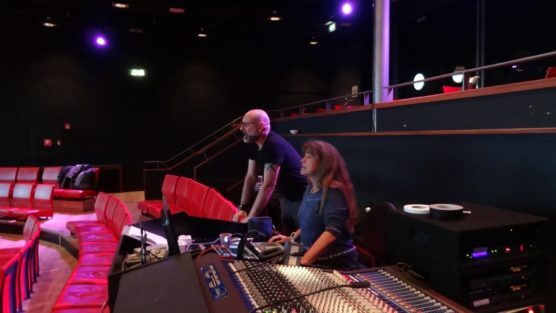 As the person behind the light board, there is an obvious visual position I have that is located equally to the public view in a playing space. It is from this position I make choices. The aim in this workshop, is to guide the dancers towards recognizing from their visual position, how light is affecting the, time, tension and atmosphere in the playing space and to discover an interactive relationship with me behind the board. The question we will address is; how does light influence real time performance? CV – Started in 1989 in the music lighting but changed quickly to theatre and modern dance. In 1994 Katie Duck asked her to do the lights for her improvisation performance. All she said was “surprise me”, so she did and continued doing.Since then they have been working together. Among other projects in Magpie Music and Dance Company, where there is an instant interaction between the disciplines dance ,light and music. In the past years Ellen improvised with many performers, such as David Zambrano, Michael Schumacher, Gonny Heggen, Nederlands danstheater 3, Katie Duck en Lily Kiara. In the work with Lily Kiara, in their almost organically growing collaboration, there is a very close interaction between lights and dance. They continue to develop their findings and always look for possibilities to stretch their ideas a little further. Ellen has been teaching workshops at the School for New Dance Development en Amsterdam, to share her vision that light can be played with as an autonomous element; light as movement, rather than a static aspect of the performance. Light can change the sense of space, time and atmosphere.